TINANA'S Tony Harold wants to save his neighbours the pain of having their livestock brutalised. Mr Harold woke up to the shocking sight of a dead lamb on his property when he went out to check on his animals on Monday morning. The lamb was only a month old and he remembered hearing its mother calling for it through the night when the attack happened. One of his rams and another lamb were also killed while he also had to put down a ewe, which was only two weeks away from giving birth to its first lamb, because of the severity of the wounds it had suffered as a result of the attack. 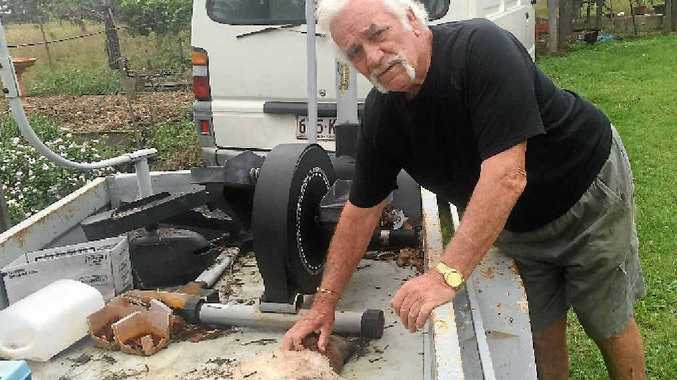 Mr Harold fears a pack of either wild or domesticated dogs were responsible for the attack and he says the dogs could target his neighbours' livestock if they aren't aware of the issue and don't take measures to protect their animals. While wild dogs was a possiblity, Mr Harold said he felt it was more likely domesticated dogs that were responsible for the attack as the sheep weren't eaten, just killed for sport. Mr Harold said he hadn't experienced anything like the attack before and he had been left heartbroken over the loss of his animals. He said he regarded the animals as pets and that made the loss harder. Mr Harold said because he hadn't suffered any losses before the attack, he had "got complacent" and let the sheep stay in their paddock of a night. Now he would be bringing them closer to his home at night, Mr Harold said.